Book Reviewer, Writer, & Dandelion lover! 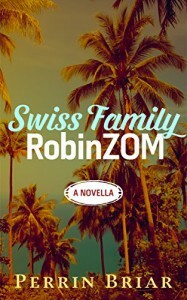 Everyone has probably heard about Swiss Family Robinson right (you know that family from Switzerland that made a home on an island). Well, what happens if zombies was the reason they landed on the deserted island in the first place? I think Bill, the father needs to man-up and stop worrying that zombies may have been real people - they aren't now so kill them!